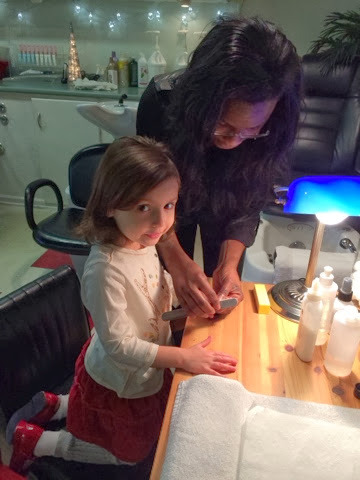 Yesterday, Ava and I went to my hair salon for some pampering! We both got manicures and she got a haircut. The best part is that we went on a Monday morning so we had the whole place to ourselves. Our manicures! Ava loves hers! Getting her hair washed. She loved the animal drape. Hair is done and styled and she's getting her mani. On the way to the salon, told her that we'd be with Rhonda and Danielle and she practiced saying their names. 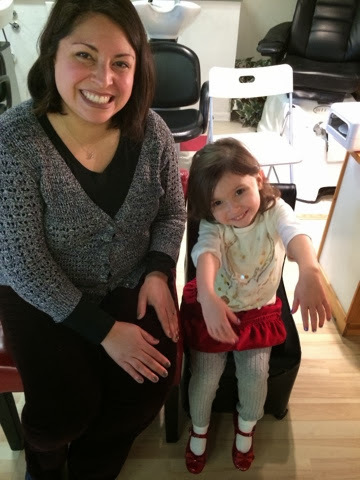 She got her haircut by Rhonda, the salon owner that does my hair. She asked to grow her hair longer so Rhonda just cleaned up her hair to give it some style. We're growing our her bangs too, which is a long process. Her hair is growing in thicker rather than longer it seems. 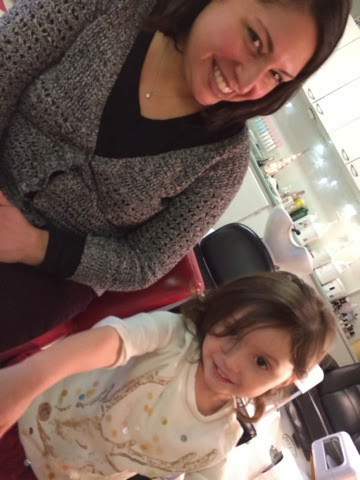 The girls at the salon enjoyed having Ava there. 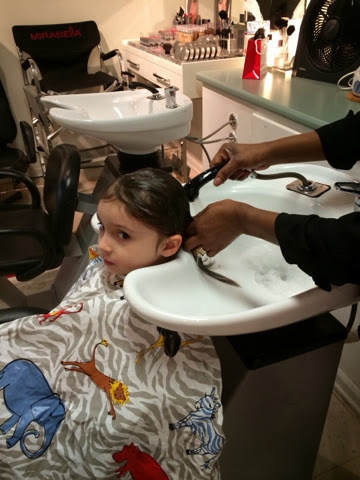 She acted like a little lady, sitting tall in her chair for her haircut. She asked Rhonda is she would get a prize at the end, just like her doctor's appointments. That cracked us up. Sure enough, Rhonda gave her a little bag with lots of fun stuff in it like a ball, swim goggles, play money, a play ring, and little nail polishes. 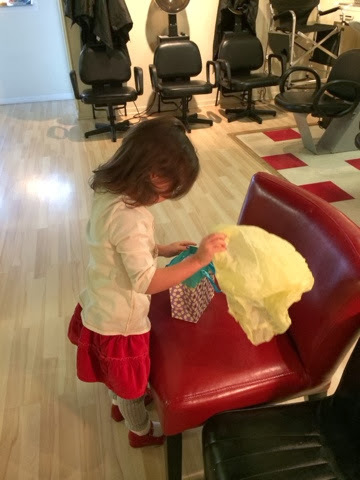 She was so excited and even carried it around like a purse. Just before we left, she found the candy dish in the waiting area. She served us each a peppermint on a silver coaster like a plate. The girls loved that too! 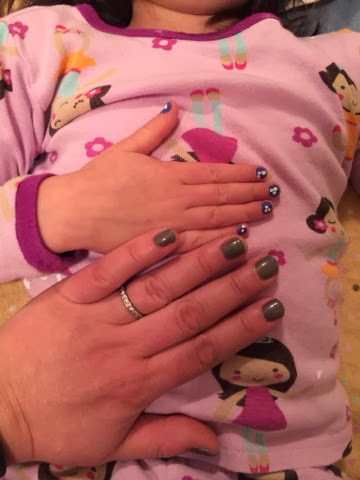 Ava was so excited that when Aaron got home, she showed him her new manicure right away. And she showed her girlfriends at school this morning when I dropped her off. She loved it! Having a daughter who's so feminine is really fun. I wonder if this phase is temporary, but I'll enjoy it while it's here. Maybe we'll make it a tradition to go around Christmas time to the salon together. That was fun! This might be a fun annual tradition! 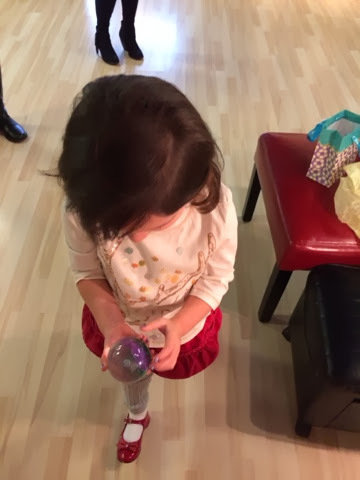 She asked for a "prize" like at the doctor's office.